Charlotte certainly has many nicknames - and seems to add more as the years pass. "Charlotte Town," its first official name, was settled around 1755 and incorporated in 1768. It was named after England's King George III's wife, Charlotte of Mecklenburg-Strelitz, to pay homage to her and to supposedly encourage George to develop the region. 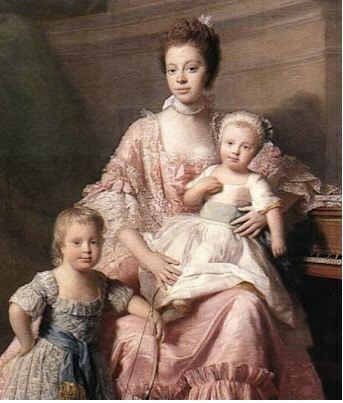 Queen Charlotte and a few of her children. The queen - hence the "Queen City" - was a gifted botanist, patron of the arts, and reportedly of African descent. Despite her busy schedule with plants, artwork and whatever else royals did in the 1700s, she produced a whopping 15 children for her husband. It would be remiss of me not to point out that the city's LGBT community has developed a fondness for the "Queen City" moniker, using it as a tongue-in-cheek reference to the ever-growing gay population. "Hornet's Nest" dates back to the Revolutionary War, when General Charles Cornwallis, a big loser of an English commander (we can thank him for giving us the American colonies), invaded the area and was eventually driven out by hostile and extremely efficient locals. That prompted Cornwallis to dub Charlotte a "hornet's nest of rebellion." 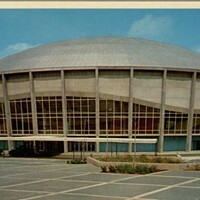 Although Charlotte is now known as one of the Southeast's most progressive cities, it wasn't always that way. In fact, it was once quite conservative and boasted more churches per capita than any other city in the country. Once acknowledged as the home of Southern Presbyterianism, many other denominations would flock to the city as it grew, which eventually led to yet another nickname: "The City of Churches." Despite the change in political climate and the growth of other belief systems in the area, Charlotte still maintains some of the roots that spawned the nickname. The "Hornet's Nest" was cited as the seventh-most "bible-minded city" in the U.S in a recent study conducted by The American Bible Society. Another nickname, "The City of Industry," pays homage to a period of Charlotte's economy. In the late 1800s and early 1900s, Charlotte was known chiefly for its textile manufacturers and the large number of mills in the area. 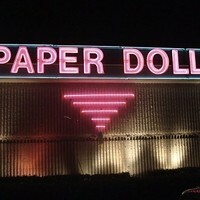 But times have changed; textile no longer fuels the local economic engine. Despite recent economic upheaval, Charlotte is known as the second-largest banking center in the United States, hence "Banktown." Bank of America calls the city home, as did Wachovia, which was taken over by Wells Fargo in 2011 (Wells maintains its East Coast headquarters in Charlotte). "NASCAR Central" is another no-brainer. 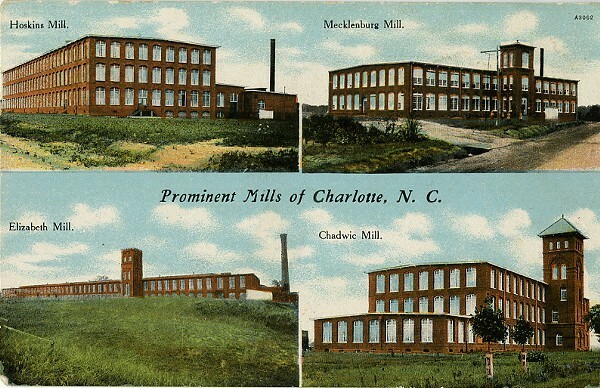 An early 20th century postcard that depicts Charlottes's textile industry. "The Energy Capital" is newer and perhaps less obvious, a product of Duke Energy buying Wachovia's skyscraper in Uptown. Since then, a number of power-producing and electrical-related companies have relocated to the area, which could eventually lead to yet another shift in the city's economy. I've found no specific origin for "Crown Town" or "The CLT," but they ring slightly of hip-hop culture. Mostly they're just fun. Oh, by the way - welcome to the "City of Trees."